At 5:30am our guide will greet you at hotel. From the hotel we will travel by taxi to where all the life is in Hanoi. First we travel to the famous flower market where hundreds of different kinds of flowers are being sold in bulk to the flower shopkeepers. From there we transfer to Long Bien bridge where, underneath is one of the biggest and busiest fruit markets in the country. Both these markets are only seen in the early morning. Next we will travel on foot and see the Old Quarter begin to wake up. You will see street side markets preparing for the morning. 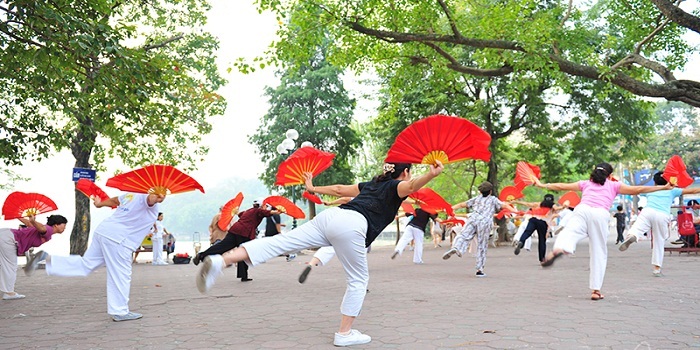 We’ll also make our way to Hoan Kiem Lake to witness, and maybe even take part in, people, young and old, exercising, doing Tai Chi, and jogging. As the sun rises, and the light becomes perfect, take every opportunity to snap some of the best photos of your trip.